Because it is a flowing move, the wheelie drop doesn't require you to stop and balance on the rear wheel, yet it gives you much more control than a free-ride (straight jump) approach. 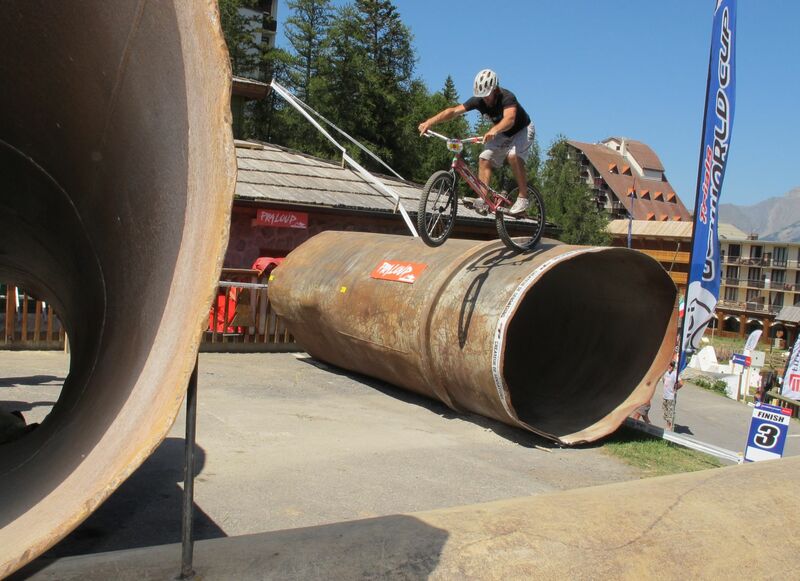 Andrei Burton pulls a wheelie off a large pipe. This only works if the obstacle surface is smooth enough (without pot-holes) so you can start a wheelie with one or two pedal strokes and finish off with the drop. 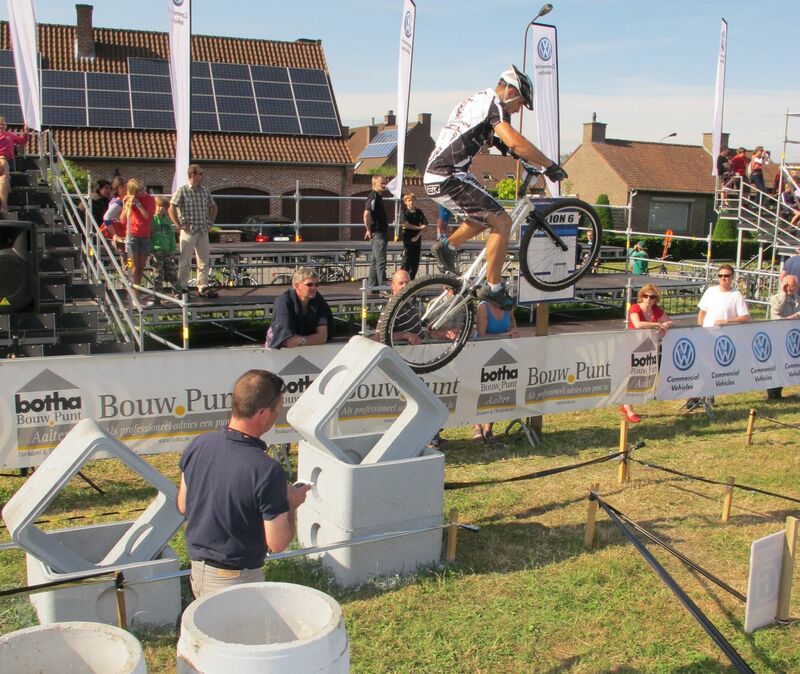 It is a very useful technique to jump off obstacles with large rounded or slanted and slippery edges where hopping on site would be difficult, but it is also a stylish way to ride off big square steps without stopping over the edge. Start rolling down small kerbs and build it up progressively. Jack Carthy rides off a narrow beam. If you have enough room for two pedal strokes, this move starts pretty much like a rolling pedal hop. From a trackstand position, ride the first quarter of a crank turn on your strong foot to set the bike into motion and crouch progressively. Follow up with the second quarter turn on your lazy-foot, leaning back and pulling on the handlebars to lift the front wheel slightly. Kenny Belaey lets his rear wheel roll down. Finish-off the crank turn on your front foot but without any impulse so as to let the rear wheel roll off the edge smoothly. With some practise, you could even start directly with your driving pedal and only perform a quarter crank turn before the drop. 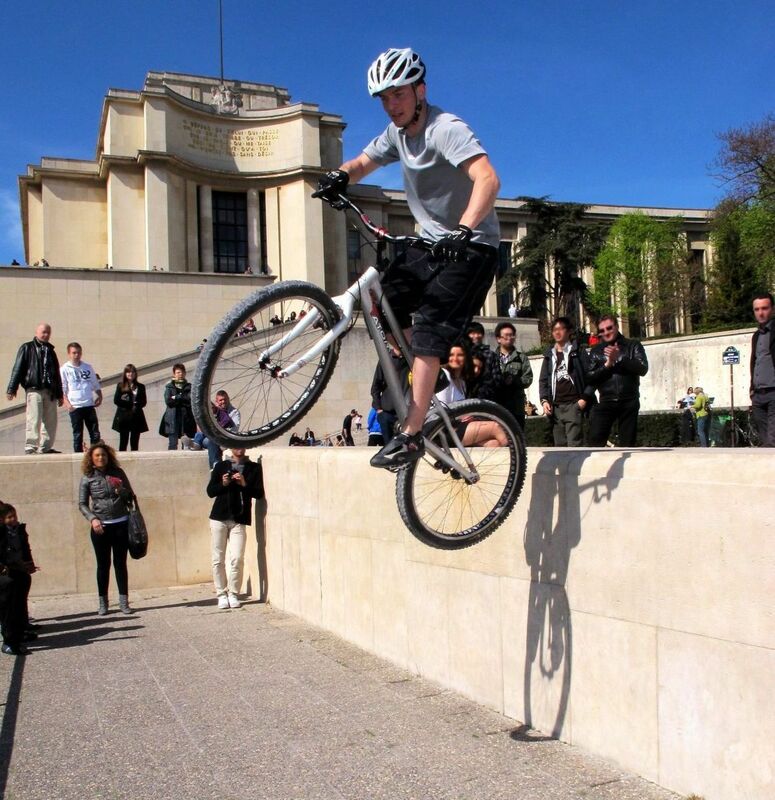 Let the bike drop smoothly as the rear wheel leaves the edge and pull slightly on the bars to tilt the bike vertical. 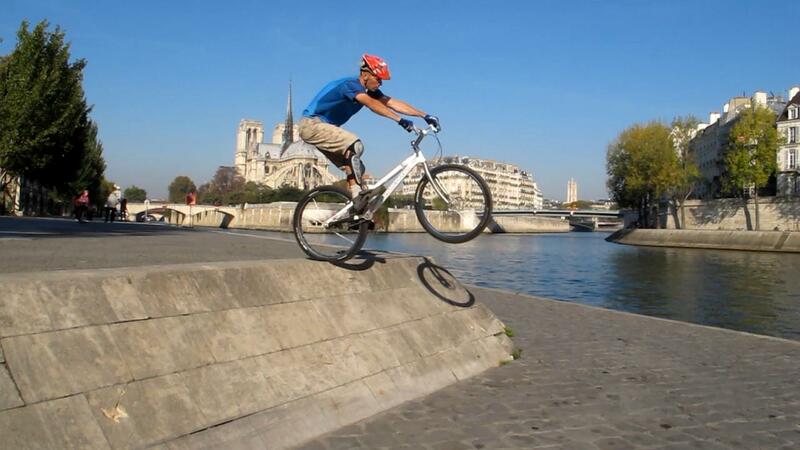 Stretch your legs to drop the rear wheel further and prepare for the landing, feathering the rear brake. Upon landing, either give the rear brake a slight touch to control a wheelie, or apply full braking power to force the front wheel down. 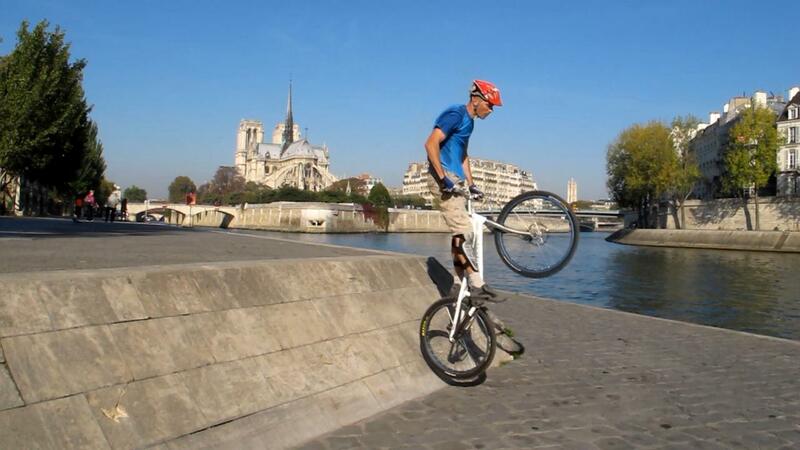 The more you lean forward, the faster you'll bring the front wheel down. By adjusting your weight further back over the rear hub, and with a lot more practice, you'll be able to land directly into a wheelie or even carry on with a manual after landing. 1° From a trackstand position, ride the first quarter of a crank turn on your strong foot to set the bike into motion and crouch progressively. 2° Follow up with the second quarter turn on your lazy-foot, leaning back and pulling on the handlebars to lift the front wheel slightly. 3° Finish-off the crank turn on your front foot but without any impulse so as to let the rear wheel roll off the edge smoothly. 4° Let the bike drop smoothly as the rear wheel leaves the edge and pull slightly on the bars to tilt the bike vertical. 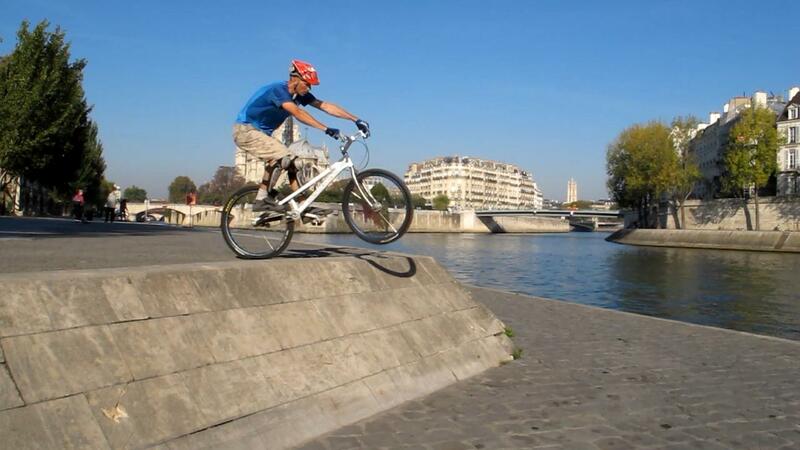 5° Stretch your legs to drop the rear wheel further and prepare for the landing, feathering the rear brake. 6° Upon landing, either give the rear brake a slight touch to control a wheelie, or apply full braking power to force the front wheel down. Hannes Herrmann lets his rear wheel roll down. Because it sets you into horizontal motion, the wheelie drop is not the best technique to drop from very high or if you must land in a limited space. Rolling on the edge makes the landing less predictable and more difficult to control than with a classic frontal drop (with a short stop balancing over the rear wheel). With practise, you can squeeze the run up distance to one pedal stroke, either facing the edge or sideways. This is very useful on slanted obstacles where staying on the rear wheel would be tricky (with uncertain grip). 1° From a trackstand position, crouch and load up your front foot, get ready to pull the front wheel up. 2° Unlock the rear brake and move up on your front pedal, pulling up on the handlebars to get into a controlled wheelie. 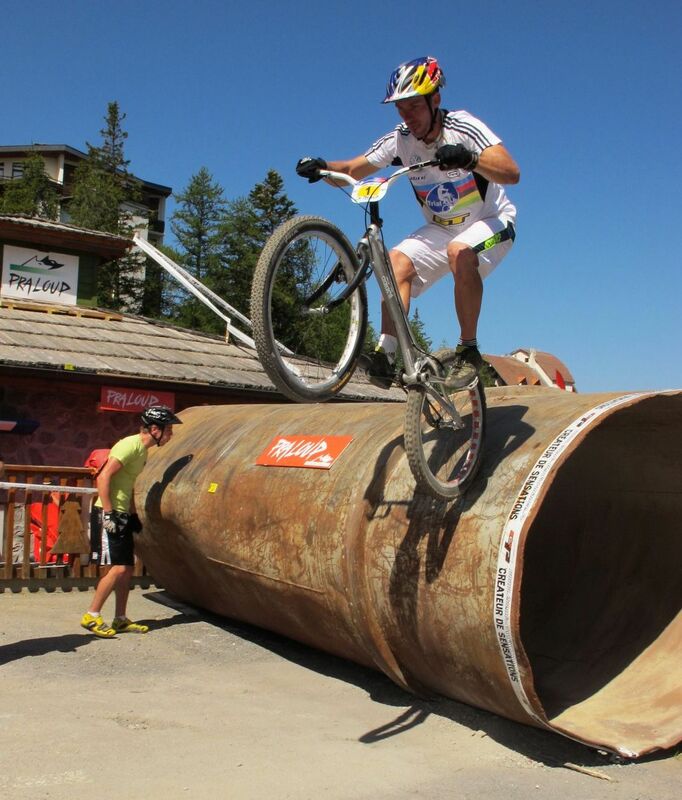 3° Finish-off with a soft pedal kick so as to let the rear wheel roll down the slope into a smooth wheelie. 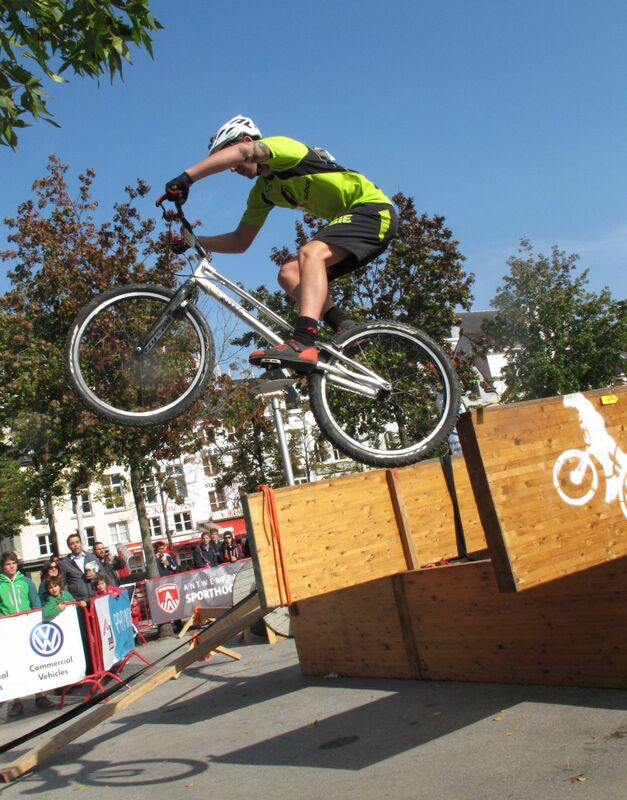 4° Let the bike drop as the rear wheel leaves the edge, pull slightly on the bars to tilt the bike vertical. Rémy D. turns 90 degrees as he rides off the edge. You can often get both wheels close enough to the edge, sideways and turn into a wheelie drop. Crouch and load up your front foot, ready to throw your weight off-balance over the drop. 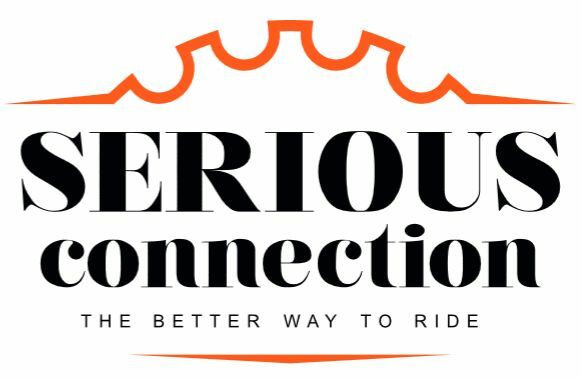 When ready, push up on the handlebars to throw your weight off-balance over the drop and use a firm but progressive pedal stroke to roll the bike off the edge. Release the rear brake and swing the bike with you as you apply pressure on your front pedal. Pull further on the handlebars to lift the front wheel up and finish off the pedal stroke as you face the drop. Let the rear wheel roll down, off the edge and stretch your legs to land with the rear wheel first. 1° Crouch and load up your front foot, ready to throw your weight off-balance over the drop. 2° Release the rear brake and swing the bike with you as you apply pressure on your front pedal. 3° Pull further on the handlebars to lift the front wheel up and finish off the pedal stroke as you face the drop. 4° Let the rear wheel roll down, off the edge and stretch your legs to land with the rear wheel first.